In this tutorial, we will learn a new interesting topic Selenium WebDriver that is the successor of Selenium RC. In the earlier version of selenium, we needed the Selenium RC server which must be started before executing the test scripts but WebDriver does not require any server to execute the tests on a particular browser. There is a separate web driver for each browser that accepts the selenium commands and drives the browser under the tests. So let's see all the points in detail. ➤ WebDriver is an interface and a pure object-oriented tool. ➤ It is a web automation framework that was designed by Simon Stewart while he was working at ThoughtWorks. ➤ WebDriver is a set of APIs (Application Programming Interface) which provides a lot of capabilities to Selenium tool. It provides a communication facility between languages and browsers. Selenium WebDriver is a free and open source library to automate the web applications. It is the merger of two automation framework: Selenium and WebDriver. In 2009, Selenium RC is merged with another testing framework called WebDriver to create a new Selenium tool known as Selenium 2.0 or Selenium WebDriver. It was released in July 2011. It is the first choice of any tester to automate the web applications. The following picture shows the architectural representation of Selenium WebDriver. Selenium tests can be written in multiple programming languages such as Java, Ruby, Python etc. Therefore, Selenium Developers have decided to develop a language bindings or Selenium Client Libraries that allow selenium to support multiple languages such as Java, Ruby, Python etc. It is nothing but different Jar files. These client libraries have Selenium WebDriver classes and methods that are needed to create automation test scripts and can be installed using package installers available with the respective languages. For instance, Suppose you want to use browser driver in Java, you will use the Java client libraries or Java jar files. All the supported Selenium client libraries can be downloaded from the official website (https://www.seleniumhq.org/download/#client-drivers) of selenium. Note: Selenium Client Libraries is not testing framework. A Selenium client library provides an application programming interface(API), i.e, a set of functions that executes the selenium commands from the program. JSON Wire Protocol is a transport mechanism created by WebDriver developers which transfers the data between a server and a client on the web. It uses a REST API to transfer the information between HTTP server. Each browser driver such as FirefoxDriver, ChromeDriver, IEDriver etc has its own HTTP server. Selenium uses a specific driver for each browser to establish a secure communication with the respective browser without revealing the internal logic of browser's functionality. This browser driver receives the requests from the language binding and invokes the relevant operations on the browser. Each type of browser has its own driver that implements WebDriver's wire protocol for that specific browser. Selenium Web driver supports both real and headless browser. For example, If you want to automate tests with selenium web driver and execute the script in the real browser like Chrome, you have to download its specific driver application. This must be done for all browsers that you want to use. 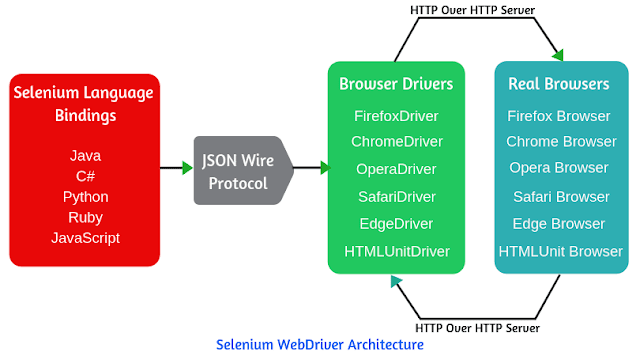 GeckoDriver(Firefox), ChromeDriver, and IE Driver are the example of the most frequently used driver and follow the guidelines of the Selenium framework. The example of the headless browser is HTMLUnit browser(HTMLUnitDriver). Let's see how Selenium WebDriver works internally? ➲ In real time scenario, When you write a code in your Eclipse IDE using any one of the supported Selenium client libraries (say Java), you will click Run option to execute the program source code. After clicking the Run, Firefox browser will be launched and it will navigate to the URL of the website. Now let's understand what is happening internally after clicking the Run till the launch of Firefox browser. When you execute any test script using the web driver, the following steps are performed internally. in a serialized JSON format using JSON Wire Protocol over the HTTP. Each browser driver uses the HTTP server to receive an HTTP request. 2. JSON Wire Protocol communicates between the client and the server by transferring the data. The browser driver receives the HTTP request through HTTP Server. The HTTP Server performs all the specific actions or instructions on the real browser and then the browser will send a request to load URL. 3. After performing all instructions, Execution status is sent back to HTTP Server over the HTTP. The browser driver again uses the HTTP server to receive the HTTP request and send back to the client library via JSON Wire Protocol. The client library passes it back to your program. The program will report as a success or failure. 1. 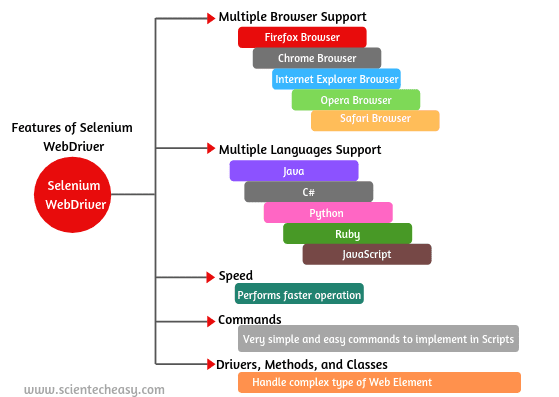 Multiple Browser Support: Selenium WebDriver supports a diverse range of multiple web browser and their version such as Firefox, Chrome, Internet Explorer, Safari, Opera etc. It also supports Headless browser called HTMLUnit browser. HTMLUnit browser is a non-conventional browser. 3. Speed: WebDriver performs the faster operation as compared to other tools of Selenium Suite. Unlike Selenium RC, It does not require any intermediate server for communicating with the browser. It provides direct communication between the WebDriver Client Libraries and Web Browser. 5. Drivers, Methods, and Classes: Selenium web driver offers multiple solutions to handle some potential challenges in the automation testing. It also helps the testers in the easy way to handle with the complex type of web elements such as checkboxes, dropdowns, and alerts with the help of dynamic finders. 6. Record & Playback: Web driver does not support record and playback features like Selenium IDE. 7. Dynamic Finder: It also supports dynamic finder for locating the web element on the web pages. ➲ Selenium WebDriver is an open source, freeware, and portable tool. ➲ It supports different operating system like Windows, Mac or Linux etc. ➲ It also supports third-party tools such as AutoIt, Apache POI. ➲ It supports parallel test execution that reduces the time taken in executing the parallel test cases. ➲ Selenium web driver also supports iPhone and Android operating system. ➲ It supports the implementation of Dynamic finder and Listener. ➲ Starting up a server in web driver is not required before the execution of test scripts. ➲ It can be integrated with third-party tools like TestNG and JUnit for grouping the test cases and generating test reports. ➲ By using selenium web driver, we can achieve Continuous Testing by integrating with Maven, Jenkins, and Docker. ➲ Selenium WebDriver can be used only to test web-based applications. We can not test Windows-based applications or desktop applications and any other software. You will have to use a third-party tool like AutoIt for testing of Windows-based applications. ➲ It is not possible to perform the testing on the image. We can perform image-based testing by integrating selenium with Sikuli. ➲ WebDriver does not generate automatically test result file. We need to integrate with third-party frameworks like TestNG or JUnit for generating test reports. ➲ WebDriver cannot support new browsers. ➲ Selenium doesn't support built-in add-ins assistance. There was a lot of limitations in Selenium RC which eventually led to the development of Selenium WebDriver. Let's see how Selenium WebDriver differs from the Selenium RC. 1. The architecture of Selenium WebDriver is simpler as compared to the Selenium RC because it controls the browser directly from the OS(Operating System) level. Selenium RC's architecture is more complicated because it uses an intermediate Selenium Remote Control Server to communicate with the browser. 3. Selenium WebDriver is pure object oriented API. Selenium RC is semi object oriented API. 4. It supports both real and headless browser like HTMLUnit browser. Selenium RC does not support headless browser. It supports only real browser. 5. WebDriver supports OS(Operating System) for mobile applications such as iOS, Windows mobile, and Android. Selenium RC does not support testing of mobile apllications. 6. WebDriver supports Dynamic finder and Listener. Selenium RC does not support. We hope that this tutorial has covered all the important points related to the Selenium WebDriver, Selenium WebDriver Architecture, Features of Selenium WebDriver, and advantages. We have tried to understand you all topics in a simple process and an easy way.